This evening, while walking The Paseo, do take a detour into the Plaza to see and participate in this extraordinary event featuring the work of Anita Otilla Rodriguez, Father Bill McNichols and El Moises. In the late 1800’s, 28 men were hanged in Taos Plaza, convicted of “treason” by an Anglo jury for resisting the American Conquest of what shortly thereafter, became “New” Mexico. The insurgents were led by Pablo Montoya, a Mexican, and Tomas “Tomasito” Romero of Taos Pueblo. As part of the show THE SANTO NINO AND LOW RIDERS, this evening in the Old County Courthouse on the Plaza, their names will be pinned to a shrine dedicated to the Santo Nino de Atocha, Patron Saint of Prisoners. Bring the names of others you know, who are suffering, or have suffered in prison, and pin them to the altar. At 6:30 Father Bill McNichols will bless the shrine and symbolically, all prisoners. The show opens today at 5pm at the old Courthouse on Taos Plaza. 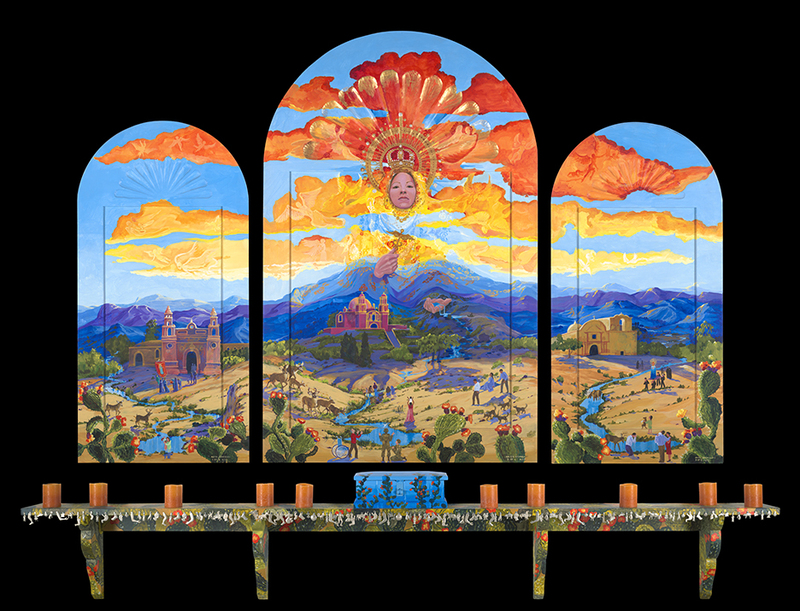 Image of painting of Nuestra Senora De Los Remedios (who heals the wounds of the Conquest) by Anita Otilla Rodriguez, care of the artist. September 25, 2015 in Art.